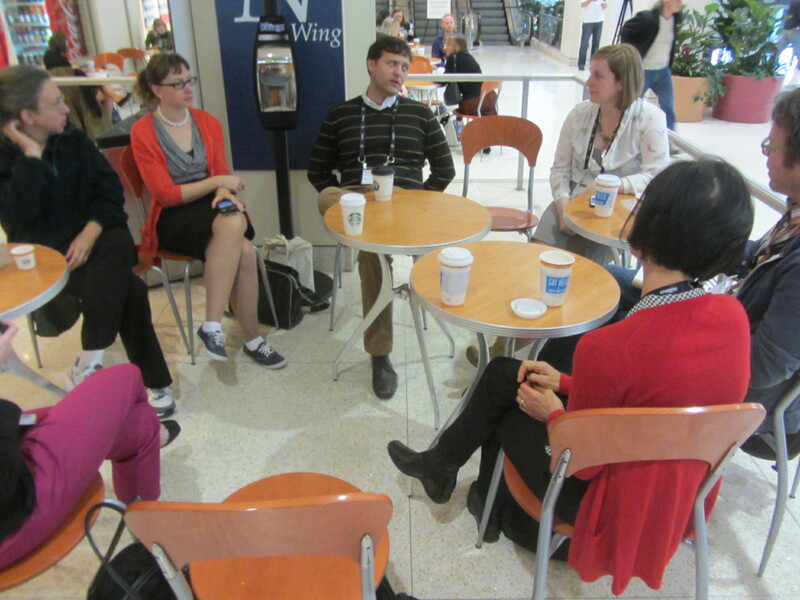 Museum bloggers converse over morning coffee at AAM 2014. Blogging is a new form of communication, often falling somewhere between professional journalism and personal journaling. There are lots of people who love museums and historic sites, and they’ve spawned lots of blogs devoted exclusively to them (including this one). To give you a sense of this specialized blogosphere, Jamie Glavic at Museum Minute has conducted more than seventy (70!) interviews with museum bloggers. Last month at the American Alliance of Museums annual meeting in Seattle, Jamie convened an informal gathering of a dozen museum bloggers to meet and chat about their work over morning coffee. I wasn’t able to catch everyone’s name, but the conversation included Rowanne Henry of Museum Stories, Chris O’Connor of the Royal BC Museum, Ed Rodley of Thinking About Museums, Jennifer Foley of Runs with Visitors, Scott Tennent at Unframed, Annelisa Stephan at the Getty Museum, and Kellian Adams at Green Door Labs. curators and conservators don’t consider blogging as scholarship; it’s not regarded equal to an article or exhibit catalog for measuring job performance or professional development. What do you think? Does the cultural divide between educators and curators continue online? Are the distinctions around museum blogging accurate and true? Share your thoughts in the comments below. This entry was posted in Community engagement, Leaders in the field, Social media, Technology and tagged Annelisa Stephan, Chris O'Connor, Ed Rodley, Getty Museum, Green Door Labs, Jamie Glavic, Jennifer Foley, Kellian Adams, Museum Minute, Museum Stories, Rowanne Henry, Royal BC Museum, Runs with Visitors, Scott Tennent, Thinking About Museums, Unframed on June 26, 2014 by Max van Balgooy.